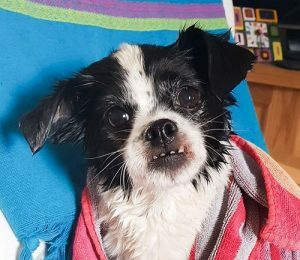 6/11/18 – Daisy has found her new home! Daisy is a chipper little Chihuahua X Jack Russell Terrier, thought to be 9-11 years old. She’s in the Oldies Club rescue, in a foster home in Pontypool, South Wales while she waits for a permanent home. A good girl in foster: Daisy settled in brilliantly, right from the moment she arrived in her foster home. She took all the newness in her tiny stride. After only ten days, all facets of her sparkling personality shone through. Can be left for a few hours: Daisy has been left for around 4 hours since being in foster and was absolutely fine. She does love company though. It’s thought she could live with a part-time worker but not full time, as she needs her snuggles! 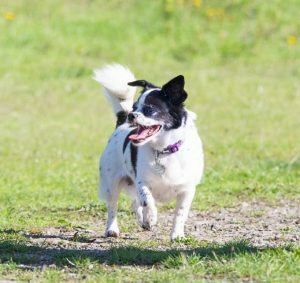 Good with other dogs: Daisy greets other dogs nicely when she’s out and about on walks. She would be happy to live with other calm dogs too, as long as they give her space and time to relax. Good with cats: Daisy has lived peacefully with cats before. With careful introductions, she should be fine to live with dog savvy ones again. Good with children: Daisy loves children and was great with a visiting 6 year old recently. She does, however, need to be able to relax. 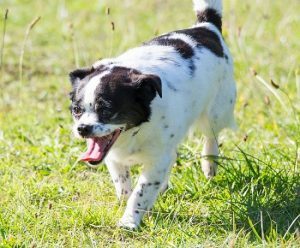 A home with resident older, sensible children or just visiting children would be best for Daisy, particularly as she can be easily startled by sudden noises. Loves her walks: Daisy’s happiest hobby is exploring the outdoors! She does like to sniff around a lot and can be stubborn when you try to move her on. It’s best not to let her off the lead as her recall is absolutely terrible! She doesn’t run away – she simply becomes so engrossed in her adventures that she doesn’t take any notice of where her owner is or what they’re saying. Any training goes out the window when it’s walkies! She’s used to having two, half hour walks a day and since she’s such a friendly girl, she a pleasure to take out. Good in the car: Daisy travels well in the car, finding comfort and adventure to be a jolly combination. 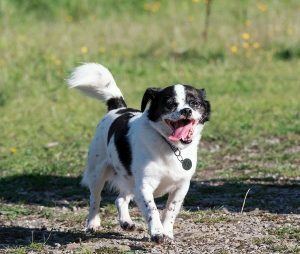 Daisy’s favourite pastimes: Walks are Daisy’s most favourite activity, closely followed by lots and lots of belly rubs! She insists on having belly rubs from almost everyone she meets. But be warned… once you start, she won’t want you to stop! Daisy’s dislikes: Daisy is quite a jumpy little dog. Loud noises such as cupboard doors slamming shut, dropping a spoon in the sink or simply someone coughing can be a bit frightening for her. She’s getting more relaxed with time but will need some consideration in her new home. She’s also unsure about walking through doorways, especially in new places. She will walk through if her owner shows her the way, but she does need some reassurance. Bless her! 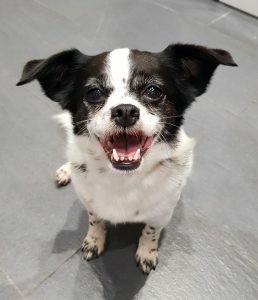 Daisy’s ideal home: Daisy would thrive in a calm, relaxed home environment, preferably with someone who’s experienced in giving excellent belly rubs! She likes greeting visitors but does need plenty of peace and routine too. She loves to be close to her owners and gets attached quickly, so wants a home where she can snuggle up next to you on the sofa. Health notes: Daisy is spayed, microchipped and flea/worm treated. She will be fully vaccinated by the end of October. As you can see from her photos, Daisy has an undershot jaw. This doesn’t cause her any discomfort, but combined with the fact that she has some teeth missing, she does have a little trouble eating her food. It’s best to feed her wet food, mashed up with a little warm water from the kettle (she has this twice a day). The vet mentioned that Daisy has a slightly cloudy left eye, but this is nothing to worry about and does not require any treatment. 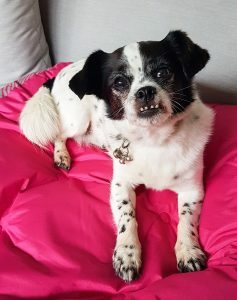 Daisy can be rehomed anywhere on the UK mainland, subject to a satisfactory home visit, but note that you will be required to travel to the foster home to meet her.